Wooo hooo! 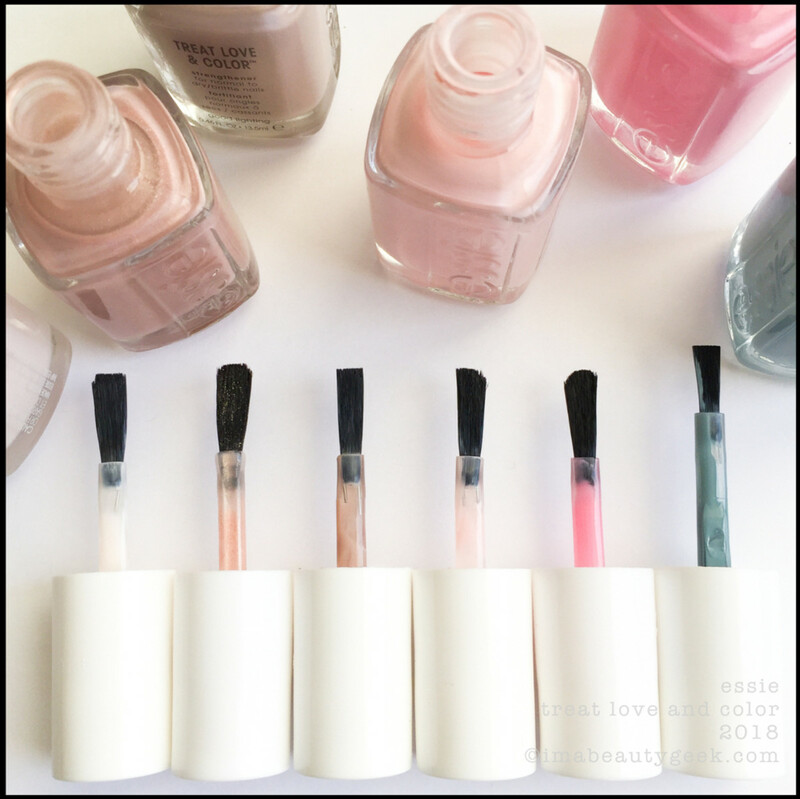 Essie is crankin’ out a whole whack of new Treat Love & Color (TLC) shades for 2018! A bunch of new additions to the existing collection means you’ll now get to choose between sheers, shimmers and crèmes that eliminate the need for either base or top coat and apparently do happy things for your nails. 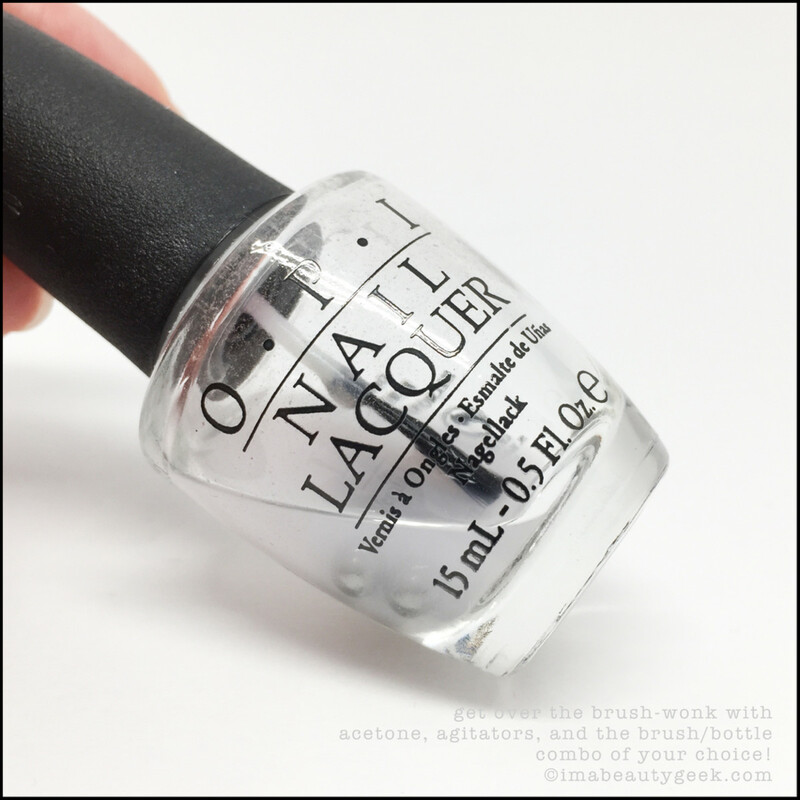 Treat – restore dry, brittle nails to a healthy look in just one week. Love – pamper your nails with a formula that locks in moisture and perfects nails. Colour – enhance nails instantly with visually-brightening pigments for healthy glow. Seeing as there are lots of photos to show you, we should start, yes? I’ll just go in the order I swatched in because that’s the order my notes are written in. And don&apos;t worry, you&apos;ll know pretty quickly why that word "except" is up there in the dek. 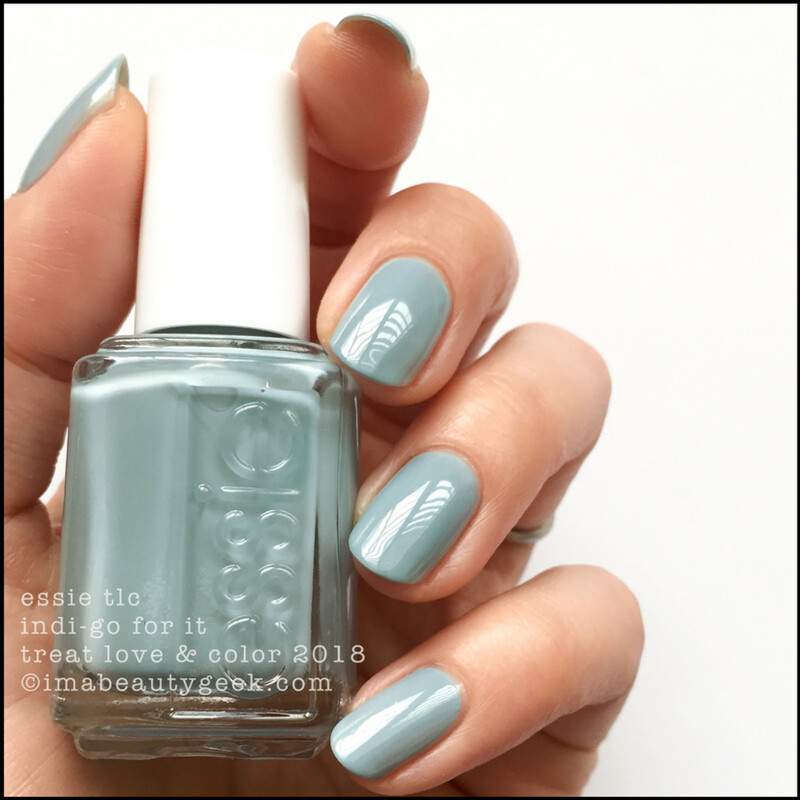 Essie Minimally Modest TLC – Treat Love & Color 2018 (above). Yessie paddle brush! Yay! 2 coats. Let 1st coat set up before you do the 2nd – if you do a 2nd. Dry time is a little slow without a quick dry top coat (QDTC), but you ain’t supposed to use base (I even took off mah gel!) or top, so I didn’t. But I really, really wanted to add QDTC to speed the slow dry time. Also, I did this polish job last night before bed and it looks just as good this morning after a shower and a hair-washin’! 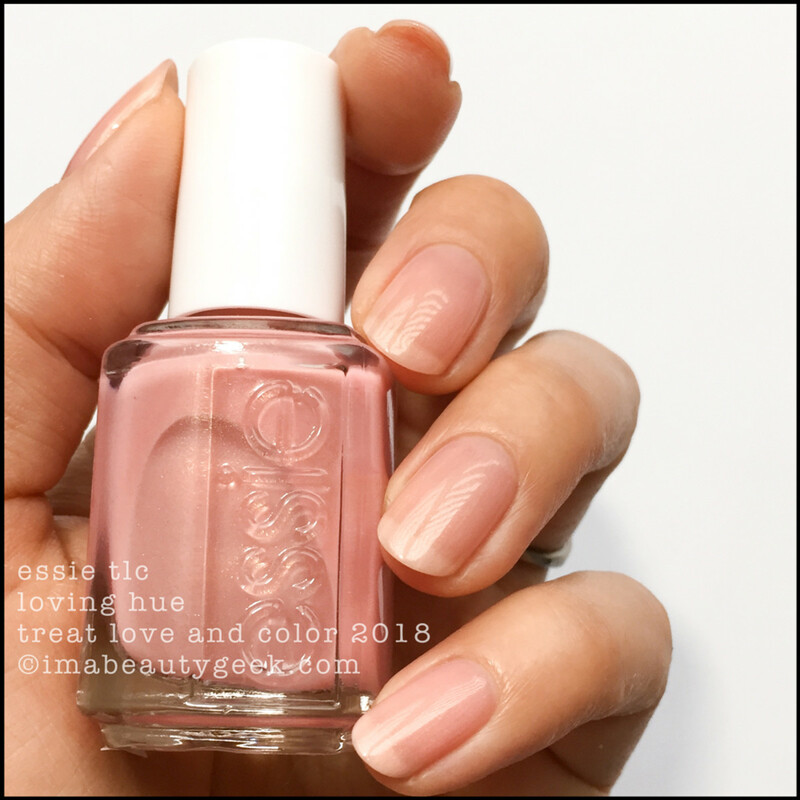 Essie In a Blush TLC – Treat Love & Color 2018 (above). Oh noes! Crappy uneven brush! Nooooo! For me, brushes like this result in gnarly streaks, so I ended up doing 3 coats of this hint-o-pink crème. The finish I got in 3 is magnificent; shiny, smooth, and opaque. 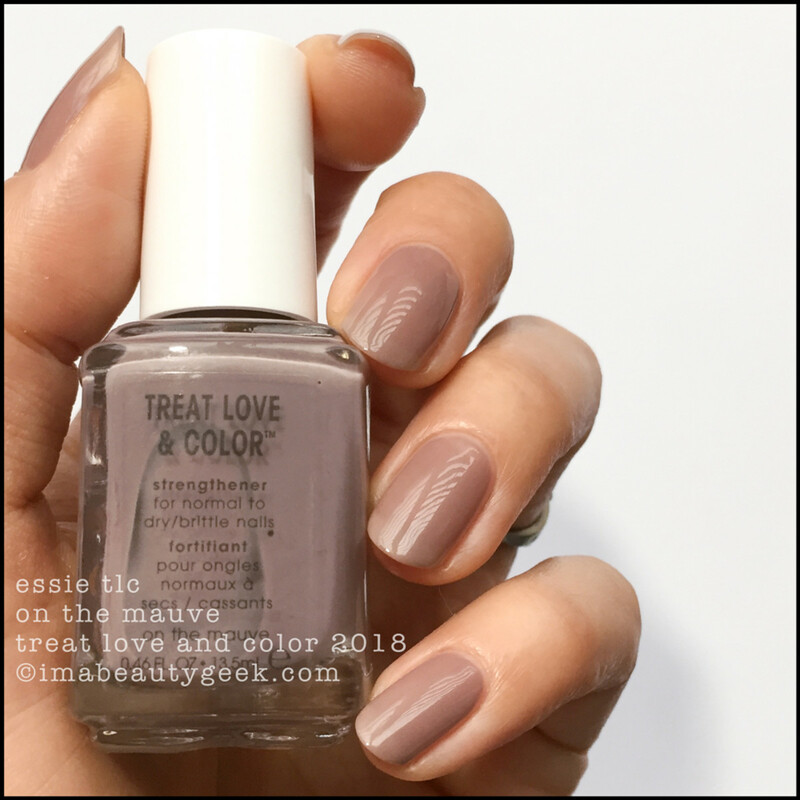 Essie Tonal Taupe TLC – Treat Love & Color 2018 (above). 1 coat just looked weird so I did 2. This stuff goes on bare natural nails SO easily! (yes, I took off my SOG so I could swatch these as they’re meant to be applied). This particular shade is not for me though. It’s too matchy-matchy to my skintone-actual. I do like the shimmery – it’s sweet. Essie Good Lighting TLC – Treat Love & Color 2018 (above). I take back anything good I said about these brushes. Every single one (yes, even the 1st) has been different AND unevenly cut. Want aggravate Manigeek? Give her garbage brushes over and over within a massive single collection. Grrrrr. Essie Pinked to Perfection TLC – Treat Love & Color 2018 (above). 2 coats + another junk brush. I don’t know if these brushes are the ones that are going to market, but for your sake, I sure as heck hope they aren’t. Giving a nail polish reviewer second-rate brushes in sample shades is a sure-fire way to get yourself a slammingly negative review – especially if it’s this many shades. Let’s hope you get better brushes in the retail bottles, yes? Essie Power Punch Pink TLC – Treat Love & Color 2018 (above). Phew! A good brush! 2 coats, with slight balding on the 2nd coat. I’m so weary of working with imperfection now, that I’m almost past the point of caring. You won’t have to use shade after shade like I did so odds are excellent that you won’t experience this level of frustration. What up with these brushes, Essie? These are the brushes from the shades I’ve used so far (above). Fun, right? Treat Love and Colour Me Unimpressed, Essie. Henceforth, let’s not talk about it anymore – I’m going to switch to my Emergency Brush Hack and assume you’ll have better brushes than these sample bottles have. Hereafter, every swatch is done using an OPI Pro-Wide brush instead of what Essie provided, k? Essie Daytime Dreamer TLC – Treat Love & Color 2018 (above). Ha! In my notes the D looks like a P so it says Paytime Dreamer! 2 coats to opaque. Essie Glowing Strong TLC – Treat Love & Color 2018 (above). That right there is a splendid 2-coat crème that levelled beautifully. 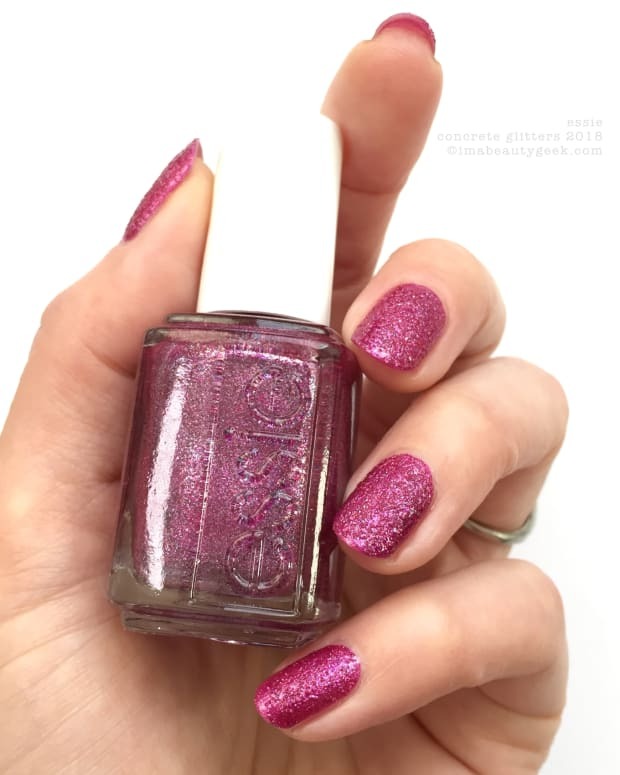 The name made me think there&apos;d be some kind of shimmer in there, but nope, there ain&apos;t.
Essie Loving Hue TLC – Treat Love & Color 2018 (above). Oooh! It’s got stealthy shimmerz! That’s 2 coats. Can you get it to opaque? Probably, but it’ll take you many coats to get there and it doesn’t dry quickly without QDTC. It&apos;s pretty as is in 2. Shimmery, sheer, and sweet. 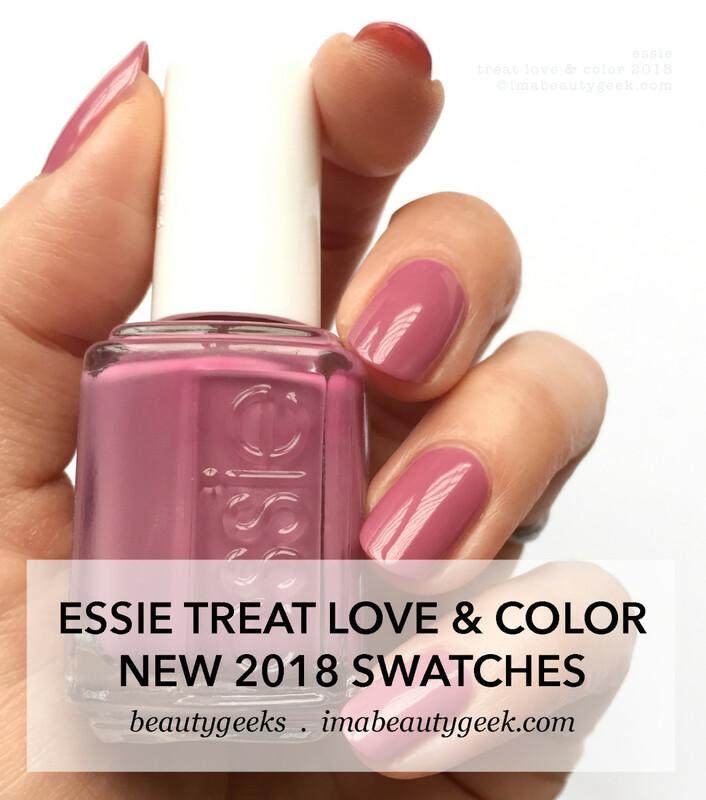 Essie On the Mauve TLC – Treat Love & Color 2018 (above). That’s 2 coats and I didn’t feel like building it anymore so I didn’t. But you can – it’d probably look better with 3. Like this, it&apos;s kind of a mauva-java latte with whip, isn&apos;t it? 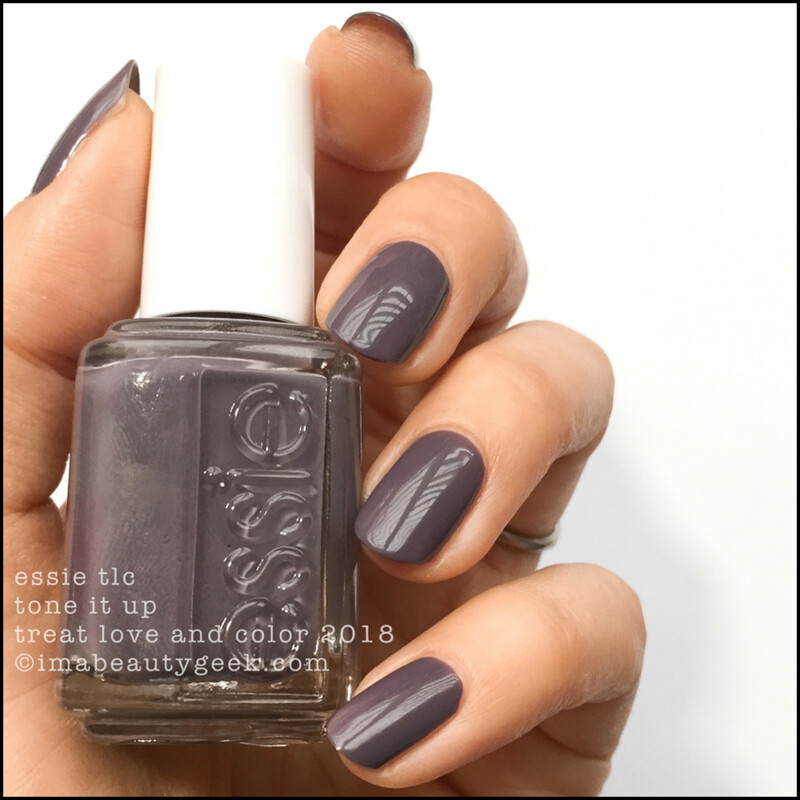 Essie Tone It Up TLC – Treat Love & Color 2018 (above). OCW!!! Hey Essie! Make all the formulas like this, please! Even if you don’t need to give your nails TLC, you should give them this polish because it’s just that beautifulz. 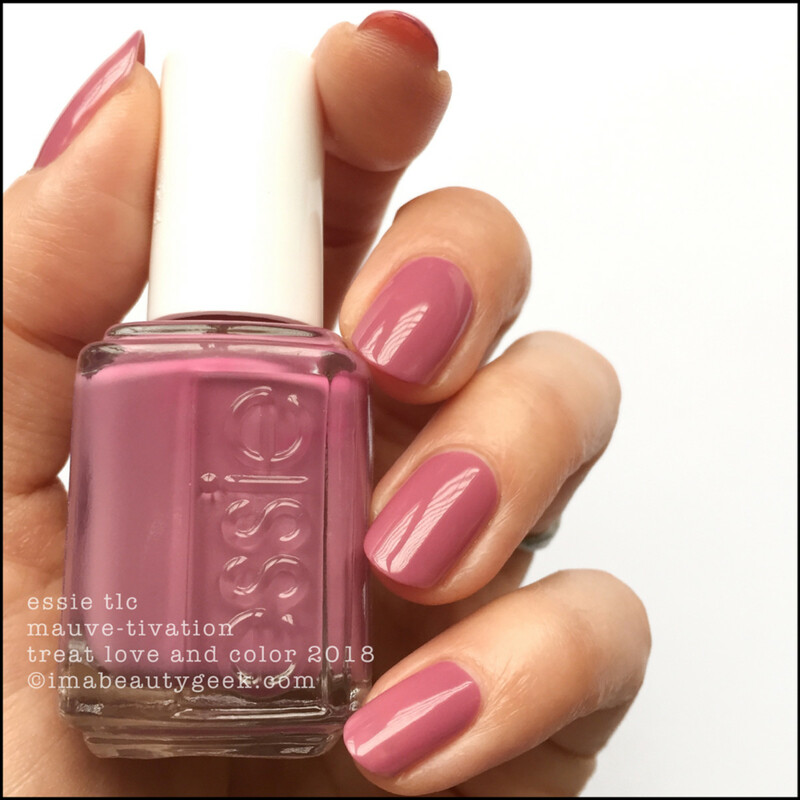 Essie Mauve-tivation TLC – Treat Love & Color 2018 (above). Whuuut? Another OCW? Amaze! It does dry down a teeny-tiny touch darker than the bottle shade but who cares? Look at it! It’s perfection! 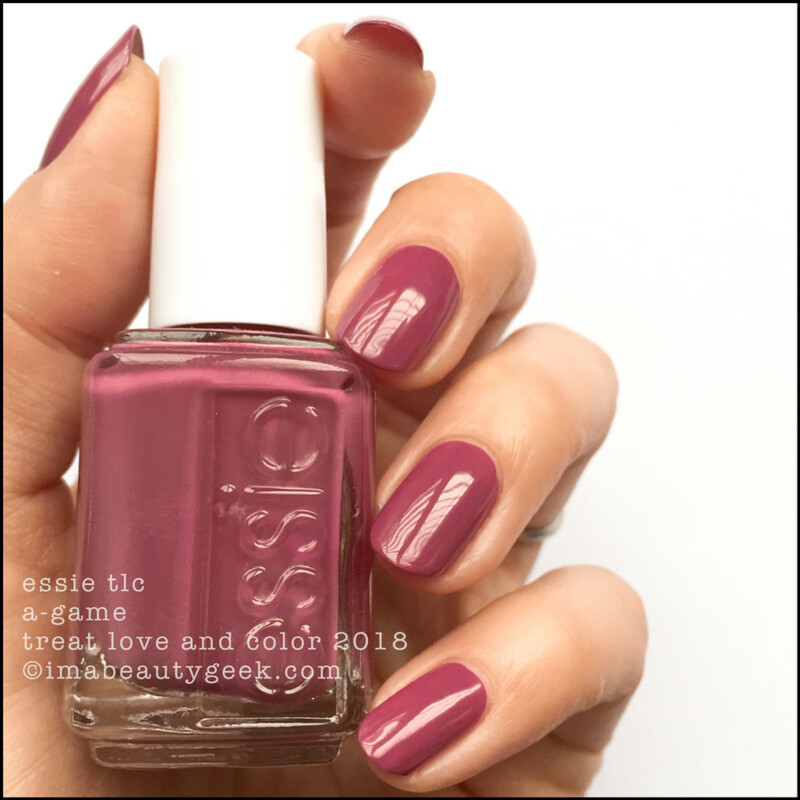 Essie A-game TLC – Treat Love & Color 2018 (above). And finally, add a whole bunch of berry to Mauve-tivation and you end up with this. Not only is it another OCW, but I daresay it’s my absolute favourite of the whole collection. Fitting it’s the last one I used, right? It brought me back to a happy Essie place – that can only be a good thing because as a general rule, I like Essie polishes. I’m one of those people who looks at this new lineup as less of a treatment and more of a colour selection. I don’t need stronger, healthier nails but I do need at least 3 or 4 of these new shades! What about you? 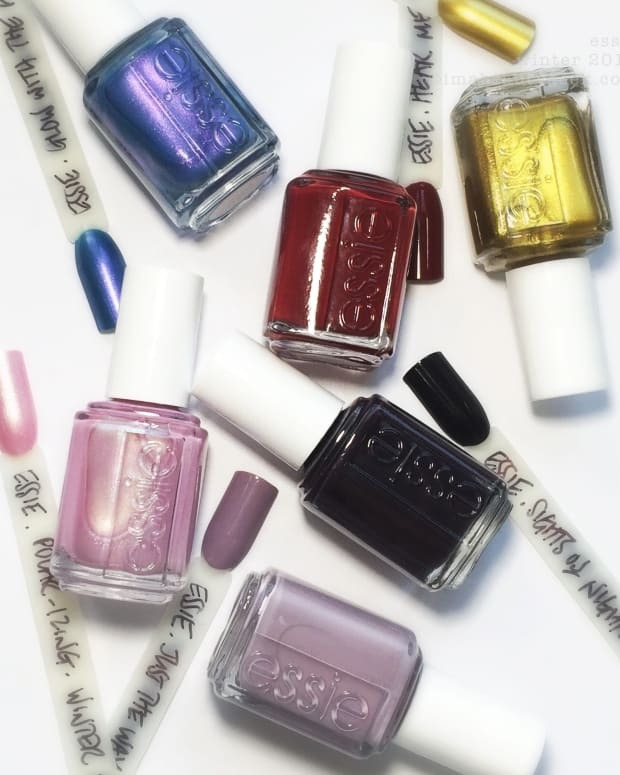 What are your thoughts on this expansion of Essie’s TLC line? Did they get you with the “treatment” part or just the shades part? Enquiring minds neeeed to know! Or, if you’re in the US (or have a mule), hit amazon.com today and you can get ‘em all (plus a bunch more shades) right, right now. For more information, visit Essie.ca. Later ya’ll! 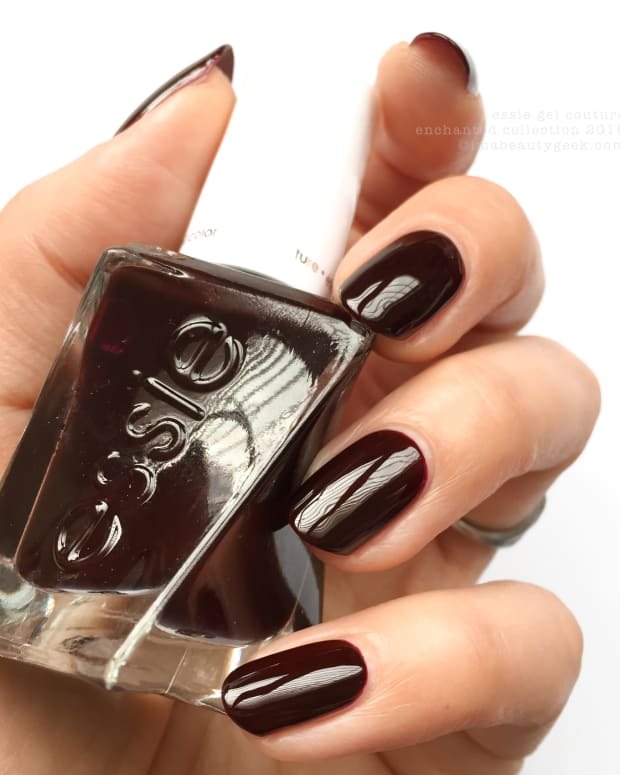 And hey, if you missed the other 2 Essie posts that went up recently – like on the Enchanted slash Spellbound bunch, and Desert Mirage – go see ‘em so that all the time I spent at my desk playing Essie for you in the past coupla weeks doesn’t go to waste. Now let’s talk Essie!! Manicures & photos Karen Falcon (She just ate 2 strawberry Pop-Tarts for breakfast. It’s 4:04pm! Oooh lookit! What’s that waaaaay up there?! Oh! That’s her blood sugar levels! Wheeeeeee!!! ).